One of the big things that separates Batgirl from Batman is that she’s an active member of her community. The move to the hipster neighborhood of Burnside didn’t just give the character a stylistic overhaul, it provided a new setting for Barbara Gordon to interact with both in and out of costume. She doesn’t live in a mansion on the outskirts of Gotham, but in the neighborhood she protects, and she goes out of her way to understand the issues that are threatening its survival. Writer Hope Larson, artist Christian Wildgoose, inker Jose Marzán, Jr., and colorist Mat Lopes have maintained the bright, energetic tone of the previous Burnside Batgirl run, but this team is spending much more time exploring the changing landscape of Barbara’s rapidly gentrified surroundings. Gentrification is a Big Bad that Batgirl can’t defeat with her fists, but she can beat up the people who break the law to take advantage of people who are deeply ingrained in the neighborhood. This exclusive preview of next week’s Batgirl #19 has the heroine rushing to the defense of a donut shop that has been in Burnside for over 30 years, quickly taking out three actors hired to scare the owners into shutting down and moving away. The excerpt showcases the best elements of this series: the sense of humor, the attention to the Burnside community and Batgirl’s dynamics with her neighbors and friends, and sleek artwork that is full of character. Christian Wildgoose is totally in sync with Hope Larson’s scripts, and scenes like Barbara’s diner conversation with Frankie and Qadir highlight the depth of expression Wildgoose brings to this cast. (That panel of an exhausted Barbara reaching for her morning coffee speaks volumes.) Jose Marzán, Jr.’s inking is very clean but still a bit loose, and it gives Wildgoose’s pencils a more organic, grounded look that makes this world feel lived in. 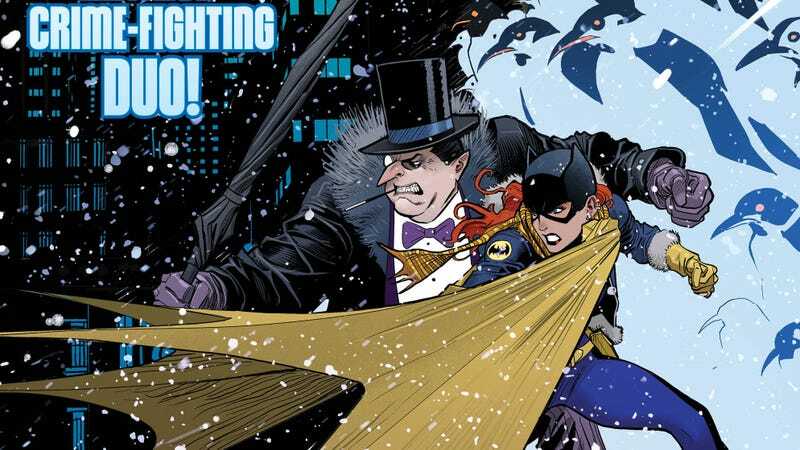 The previous Batgirl run had a glittery aesthetic, but Wildgoose, Marzán, Jr., and Mat Lopes turn down the shine without losing the charm, reinforcing this idea that Barbara isn’t a newbie blinded by the Burnside cool anymore. She sees what truly makes this neighborhood so beautiful—the people who have helped shape it over the years—and she fights to maintain Burnside’s essential identity during a time of transformation.